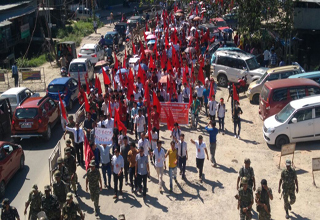 ITANAGAR, Oct 10: The Students United Movement of All Arunachal (SUMAA) stirred a massive rally against the Tibetan Rehabilitation Policy (TRP) 2014 on Tuesday amidst unprecedented security blanket imposed at Itanagar by the district administration. The SUMAA has been demanding roll back of the TRP, calling it as an infringement to indigenous rights. Hundreds of students took part in the protest rally, which started from Ganga Market and culminated at Nyokum Lapang. 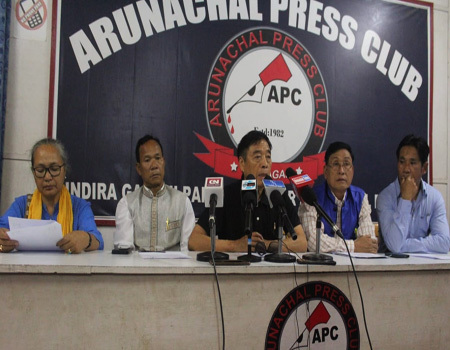 The SUMAA termed its protest rally as “anti-Tibetan refugee movement” and called on the people of Arunachal to join its movement, what it called a ‘rescue mission’ to safeguard the indigenous community. “This is just beginning, we will continue our fight against this refugee settlement issue for the indigenous rights”, reaffirmed SUMAA President Tagru Tame while speaking to media persons on the sideline of the protest rally. Tame further informed that they have served notice to respective landlords where many Tibetan refugees are taking shelter and doing their business. On being asked about unnecessary harassment caused to other Buddhist Communities in the Tibetan refugee drive, Tame maintained that the union regrets if any inconvenience was caused to Monpas, Membas and Sherdukpens, in their movement against Tibetan refugees. 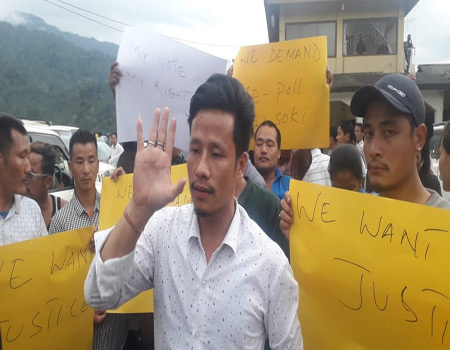 Earlier, SUMAA served an ultimatum to the state government to roll back the TRP within October 10, 2017, failing which they would start a ‘clean drive’ against Tibetan refugees residing in the Capital Complex. The union also said that it would carry out verification of identity cards against Tibetan refugees, which the district administration has already declared illegal.